Once and a while I stop to look at my life... and realize that I am not the person that I dreamed I would be. Like most other young women, I dreamed I would be that perfect Mom. The Mom who changes décor with the seasons. The Mom who never yells. The Mom who teaches her kids how to cook, then lets them have free reign in the kitchen. The Mom who has all of the kids over to her house. The Mom that keeps everything nice and tidy... and puts on a fabulous spread at dinner time. Are there Moms out there like this? Yes... I suppose there are. Often... I wonder how people look at me and think I am this woman. Sure, it is a compliment that someone might think I have it all together... but is it reality? Not for me. Sure... I can pull off some extraordinary things. The best red velvet cupcakes you ever ate. A Mexican feast fit for a rowdy group of friends. Beautifully decorated cakes. Creative Halloween costumes. There are people who refer to me as “Martha Stewart.” A compliment? I suppose. But reality? Nope. Because anything extraordinary takes a great deal of effort to pull off... and I seriously do not have the motivation or the stamina to keep it up on a daily basis. I am the Mom who has a pile of dirty dishes in the sink. I am the Mom who doesn’t keep her dust bunnies in the corner, but lets them race across the floor. I am the Mom who can’t seem to finish a Bible study that I really wanted to complete… and the Mom who hardly ever just sits with God. I am certainly thankful that He is gracious enough to put up with this... and He lets me talk to Him all day long. Lately I think... I am the Mom who needs a really good cry. I am who I am. The girl God designed me to be… and while I am accepting her here and now, I am hoping that He isn’t quite finished with me yet. So... I am not the person I dreamed I would be… and I’m okay with that. God has a better plan that I could ever dream anyway. And He is at work in me… everyday. He makes me real. Honestly… who could ask for more? for this award. That I inspire you is a gift... to my heart. darn it! i was about to send you this same award! rats! i love this post! i totally get where you are because i am there too! thanks for being so honest! and congrats on the award! Dawn, I SO get what you mean. Says the lady who doesn't even have "decor" let alone stuff that changes each season. I'm with you on this!! God is so good! He knows and understands! Thanks for sharing of yourself!!! Yes, this is why I love you. 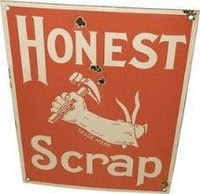 You can take something titled "Honest Scrap" and turn it into a lovely post! Gosh Dawn--I had my life all mapped out--I could go into what I thought the plan was going to be, but none of it really happened. Well, maybe some of it, but not in the order it was supposed to happen. But I am really blessed and it all happens for a reasons. There were times I didn't think the Lord was with me at all and I wasn't with him and then looking back, that is when he was with me the most and I am thankful! You are such an inspiration! I have enjoyed getting to know you and even though our lives aren't perfect--you have many gifts and a gift for sharing! What a beautiful depiction of your faith! I don't think anybody's life turns out exactly the way they dreamed. But sometimes...maybe it turns out even better? Dear Dawn, It's been a while since you made me cry, so I guess it was overdue today.